Promising early winter conditions have turned into an arid late winter/spring and now are promising a summertime Friant Division surface water supply that will seem just plain parched. The driest January-through-March precipitation conditions and discouraging April 1 Sierra Nevada snowpack data have prompted the U.S. Bureau of Reclamation to make a big cut in the Friant Division’s allocation of Central Valley Project water. Reclamation’s Area Manager in Fresno, Michael Jackson, announced April 5 that Friant’s firm Class 1 water supply declaration is being reduced to 55% of contract amounts from an initial supply declaration of 65%. If it holds, the allocation would provide just 440,000 acre-feet of water to Class 1 users with no Class 2 water to be delivered for a second consecutive year. Class 2 water is only made available when Reclamation determines that all 800,000 acre-feet of water under Class 1 contracts can be delivered. This year’s previous allocation had been for 520,000 acre-feet. That guarantees there will again be very heavy reliance on pumped groundwater for the irrigation needed to sustain crops throughout the Friant Division service area, which contains well over one million acres in portions of Kern, Tulare, Kings, Madera, Merced and Fresno counties. The new allocation is only 31% of the Friant Division’s average annual total of Class 1, Class 2 and Section 215 (unstorable) water deliveries and just 20% of the total amount of water under Class 1 and Class 2 contracts. It is possible that the declaration will be adjusted further as predictions of natural San Joaquin River runoff, as it would occur if there were no dams, continue to plummet. Bureau officials reported that precipitation in the upper San Joaquin River watershed at Huntington Lake is about 19 inches, 53% of average. 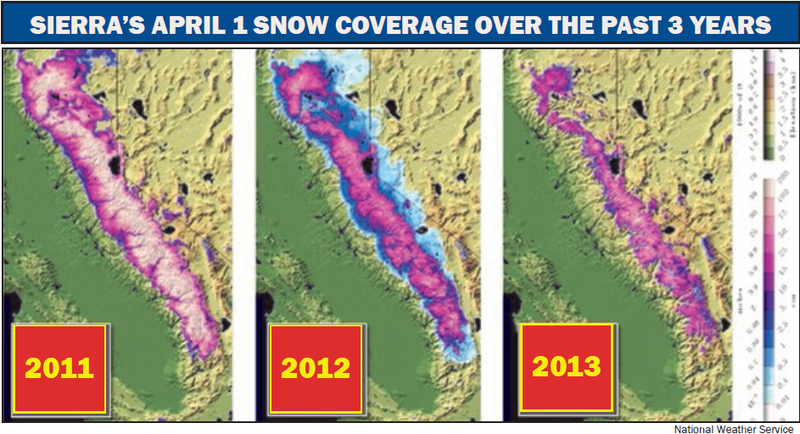 Based on the California Cooperative Snow Survey’s data gathered April 1 – the date upon which snow conditions typically reach their springtime maximum – the California Department of Water Resources has dropped its forecasts of unimpeded San Joaquin River runoff. During the peak April-July runoff period, DWR’s dry season scenario indicates the San Joaquin River could generate only 420,000 acre-feet, 33% of average. The amount of water available for allocation for Friant Class 1 and Class 2 contractors is subject to the determination of how much water must be made available for River Restoration under the 2006 San Joaquin River Restoration Stipulation of Settlement. The Settlement requires that the amount of water to be released for restoration is to be based on the projected San Joaquin River runoff and must be made available for release from Friant Dam at higher priority than Class 1 and Class 2 contract supplies. The revised allocation for river restoration is approximately 173,000 acre-feet, which is water that would have been available for allocation as Class 1 supply if not for the Settlement. The Settlement’s water management goal also provides for the recapture and recirculation of some of the water released to the river. Preliminary estimates by Reclamation personnel indicate that approximately one-third of the water released for restoration could be recaptured and made available to Friant contractors whose water supplies were reduced to make water available to the river, but the ultimate amounts of recaptured water could vary depending on hydrology and other uncertain factors related to operations of the river. If normal amounts of watershed precipitation were to occur through July (which has not happened since April 1), the San Joaquin could have runoff of 610,000 acre-feet. That would be 48% of average. The two most recent storm events brought only very light amounts of rain and snow in the mountains, and no rain at all in some parts of the valley. What storms there have been since last fall were even less generous from the Kings River south. “That part of the Sierra lagged behind everybody else for the most part. The storms just didn’t make it there. The storms were mostly to the north,” David Rizardo, chief of the Department of Water Resources’ Snow Survey Section, told the Visalia Times-Delta. Kings River runoff, assuming normal precipitation occurs, is now predicted to be 42% of average; the Kaweah River, 34%; the Tule River, 16%; and the Kern River 26%.